In connection with these rules we have made a number of changes to our themes. But what more, we have developed new GDPR plugins for helping you to collect, process and store personal data. By using these useful tools you can implement all the necessary obligations that are required. Moreover some of our GDPR WordPress plugins are available for all WordPress Themes – not only for our themes, but also for themes created by other authors. This blogpost was updated on 9th of November to bring more specific information about plugins usage. 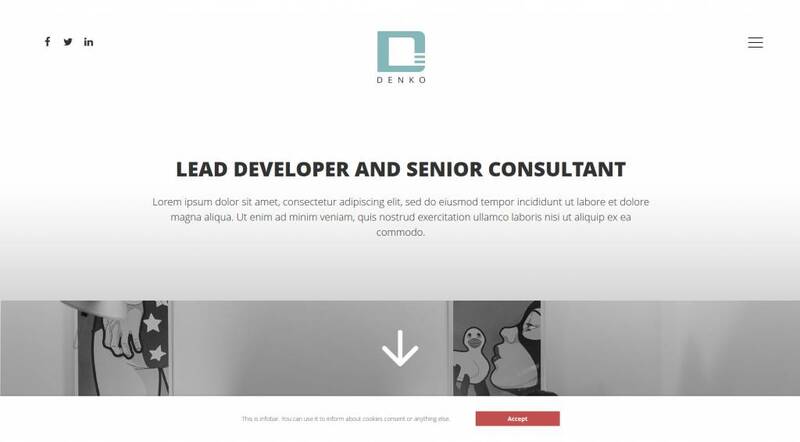 We will introduce you how to work with our Infobar – WordPress cookie plugin that allows you add bar to your website including text and button if you’d like to. After user clicks on this button (or simple on “X” when button is disabled) the bar won’t display anymore. The main benefit of these plugins is that they can be customized by website needs. You can adjust their functionality, design and purpose as you want. Because it’s closeable bar, it can be canceled by clicking on “X” or text button if available. By this “action” user expresses his consent with statement displayed inside the bar. So that’s why is Infobar perfect for get GDPR cookie consent from every user. It’s not annoying for the visitor because after closing, consequently it will no longer be visible to him. Infobar is a universal WordPress plugin (not only cookie plugin) that is compatible with all WordPress themes. You can use it with templates from other authors. If you need to collect and store customer email addresses on your website you have to do it right. This plugin allows you to work with sensitive personal data in line with the new GDPR legislation. Ait Subscribe Form adds a new element with subscribe form that can be added anywhere on the website using Ait Page Builder. This element also provides logging of user activity. 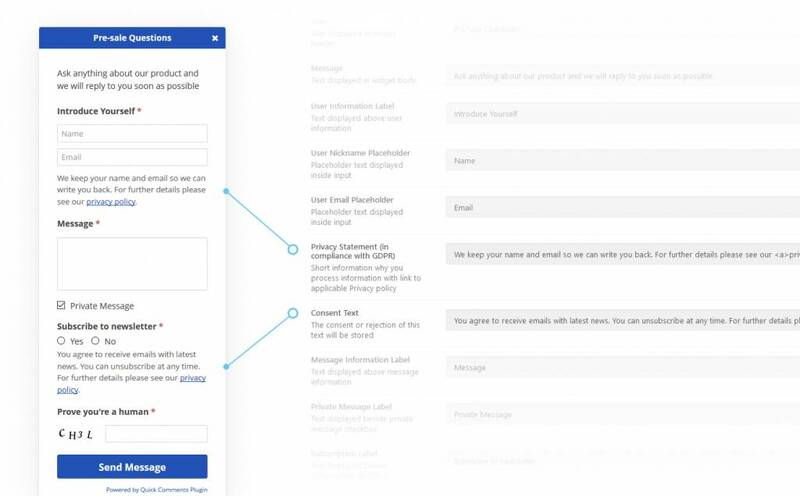 Thanks to user’s subscription activity log, you will exactly know which user (and when) expressed their consent with subscription via the form. Or alternatively when the user decided to unsubscribe from the newsletter. What’s the next benefit, Ait Subscribe Form plugin can be linked to the MailChimp account. This plugin communicates with MailChimp via API. This feature provides you the order in your email database. It means, that you’ll always know what kind of emails would like your subscribers receive. By using Ait Subscribe Form you have detailed database with chronological order of user consents with any type of emails. Comments Extension is an universal plugin which means it can be used for all WordPress themes, and even for the themes provided by other authors. Need our special plugins for GDPR compliance of your WordPress website? 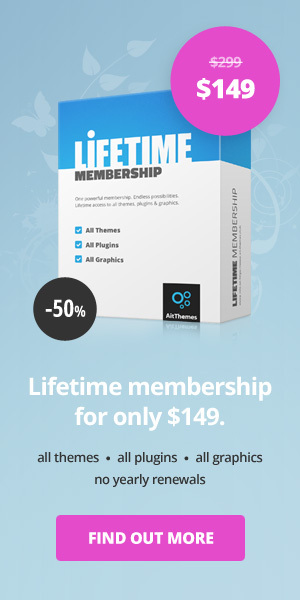 Now you can get them for discounted price in Lifetime Membership. Without yearly renewals or any additional fees. The archiving of consents including the exact wording of the agreed text is one of the most important obligations. The new feature is also integration directly with MailChimp. Now you can connect your account with the plugin using your MailChimp API Key. With this plugin, you can automate the collection and management of email addresses for marketing purposes. You need visitor’s approval for such collection. 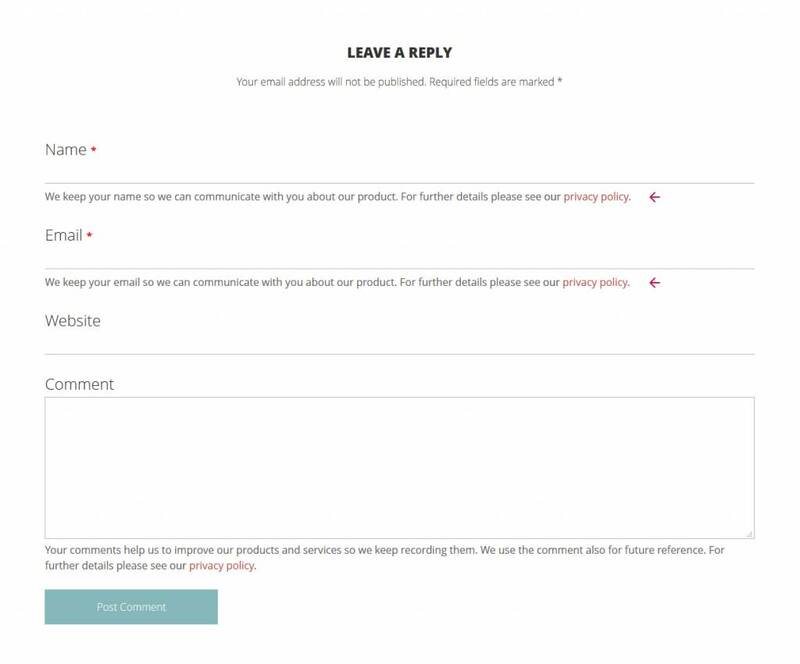 If you’re provided with the consent, the email address gets automatically imported from the Quick Comments form to your MailChimp list. It is very important that you also make it easy for the visitor to unsubscribe from the mailing list. For this operation, the user can use the same form and the change will also be reflected automatically in MailChimp. Beside plugins changes and release of brand new GDPR plugins, we’ve made updates also in our WordPress themes. 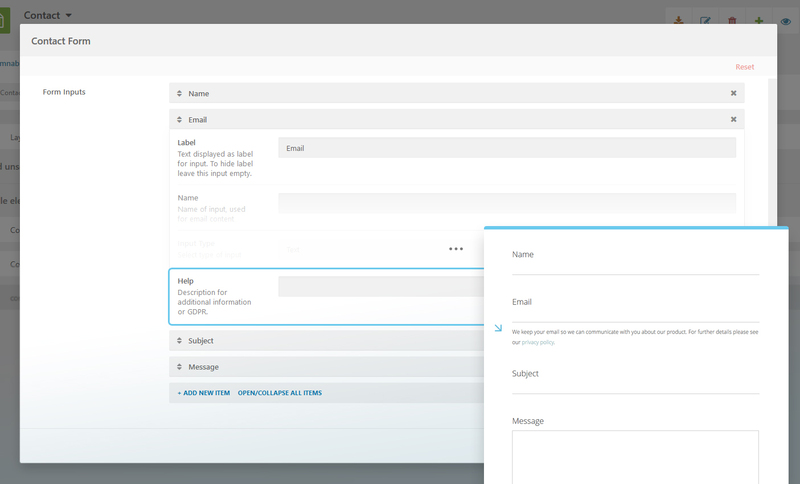 Contact form element now includes option to add help text to each input field. You can write any description, help or notice for the website visitors here. 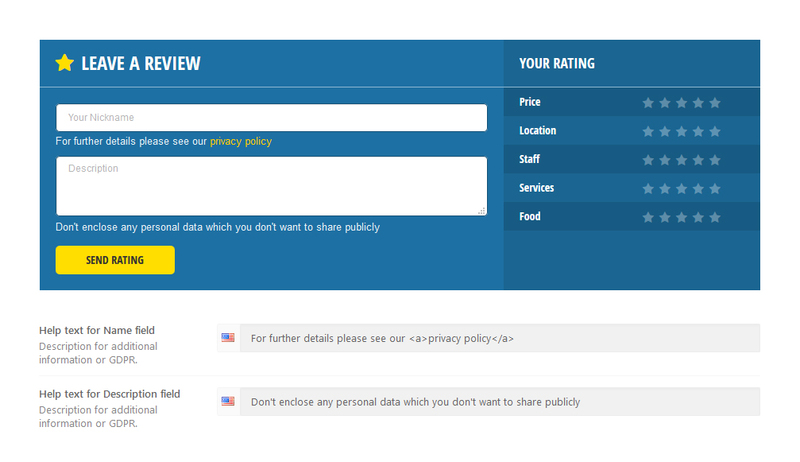 For example, you can specify the reason for which you are requesting this information from them. It’s always good to give your visitors closer information about dealing with their personal data (e.g., email or name). GDPR law requests to tell users a purpose of collecting/ processing data and in some cases you need to specify also the way, how you are going to do it. In addition to all directory templates, the updated Register form is available also for the Multi-Author Blog theme. 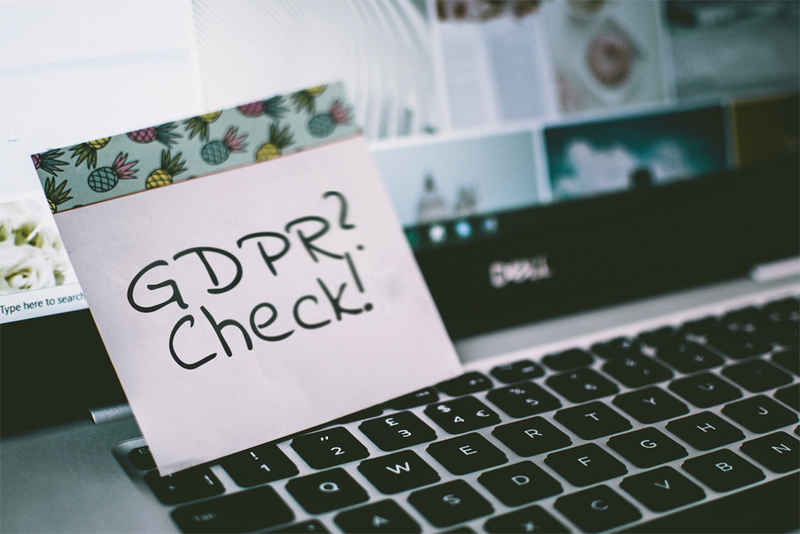 If you’re not sure what text should be inserted to individual fields to be displayed within our WordPress plugins, there exists many “GDPR for dummies” guidance and tips for better understanding the law. Also we highly recommend you to discuss it with your lawyer. Disclaimer: Please note that Ait Themes provides product technical solutions. Ait Themes Club is therefore not responsible for incorrect handling of data or insufficient incorporation of GDPR requirements. The complete implementation of the legislation must be ensured by each company individually based on the personal data it processes (or does not). Do not forget to consult your lawyer in order to help you to be fully GDPR compliant. do you have arabic planned as a translation language as well for directory+ or food guide please ? also is there any coupon or discount for the memebrehsip ? thanks a lot for interesting in our products. We are sorry, currently we have no plan to add Arabic language translation, we have no experiences with RTL design. Secondly, there is no coupon not discount feature implemented by default.